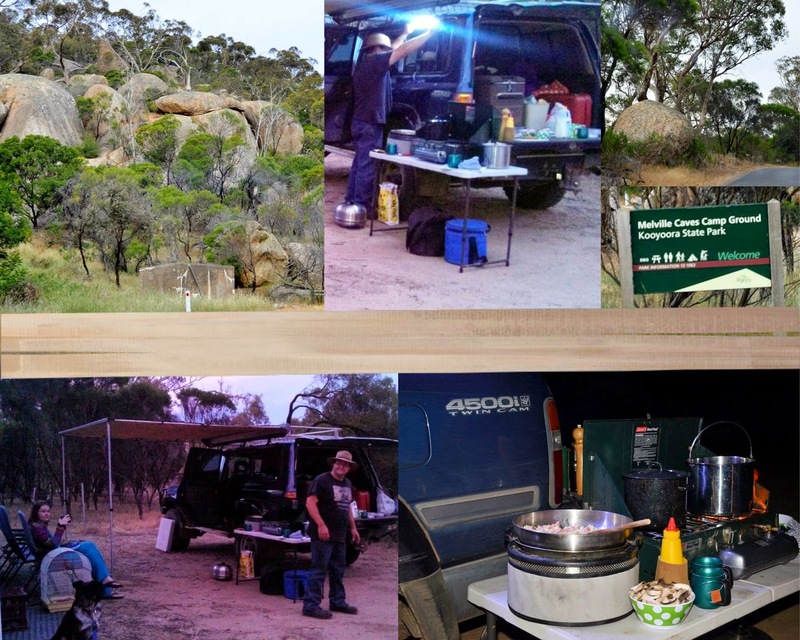 We'd seen lots of open country during the drive from Lake Hindmarsh to the Kooyoora State Park - so the huge granite boulders were even more impressive! It was around 6:30pm when we arrived, so we set up quickly. Nick parked Elmer close to the caravan and put out the awning. I used one of our camping tables and the rear tray as a cooking area. When we bought our Thumper, it came with a LED magnetic lighting strip. I can't remember using it previously but we certainly appreciated it's strong light this trip - wow! Vaughan quickly made friends with a boy his age and the two of them took over our other table, so as to play Magic the Gathering (in between bouts of toasting marshmallows at the other family's campfire)! As you can see our dinner was cooked on the Cobb Cooker, with the dual-fuel stove also being used. I'd planned an easy meal for our last night - a favourite from my Australian Bush Cooking recipe book. (You can see inside the book, here). I often make the "creamy bacon & mushroom sauce" when at home but I think this is the first time I've cheffed it while away!